To know the importance of the EU as a trading bloc. To understand present tendencies in international trade. To identify the main points of conflict in international trade. The trade policy is one of the exclusive competences of the EU. It is therefore the European Commission that must carry out negotiations with third parties relating to trade on behalf of the member states. This is one of the areas in which the EU acts as a homogeneous bloc on the international scene. In fact, the EU has managed to make itself heard with a single voice at international forums such as the World Trade Organisation (WTO), where the rules governing international trade are established. Within the WTO, the EU represents the largest trading bloc and its negotiating capacity is therefore quite substantial. In 2011, the combined EU imports and exports of goods EU represented 15.5% of the world total. Within the WTO, the EU defends positions that favour the liberalisation of markets and respect for international laws. Today, the EU faces increasingly strong competition from emerging economic powers such as India, China and Brazil. Dumping: this occurs when a company sells a particular product in another country for less than the cost of production in the country of origin. The EU has accused various emerging economic powers of such practices. Grants and subsidies: these are the names given to the different types of support that governments may give to their producers in order to make their products more competitive in international markets. The EU has been accused of using this type of support to help its agricultural sector, thereby distorting international competition. There are also what are known as safeguard measures. These are measures which restrict the importation of products into a country if this could threaten the stability of one of its productive sectors. The Generalised System of Preferences: this is aimed at developing countries and economies which are currently in a process of transition; for them, customs duties are reduced. “Everything but arms”: this is aimed at the world’s 49 poorest countries. It allows the free entry of all merchandise from these countries, except arms, into the EU. Do you think that the EU should have reviewed the situation of Bangladesh after the recent incidents in some of its textile factories? Many of these textile factories work for European companies. What responsibility do they have for this type of accident? Is it possible to consider that companies established in countries that do not respect the rights of their workers are taking part in free competition? 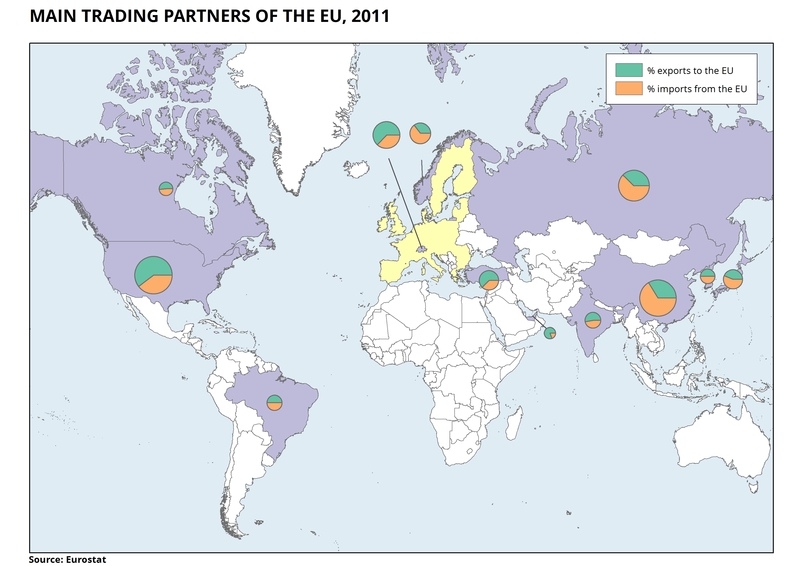 >15 Main trading partners of the EU 2011 (en, es). The countries shown on the map provide 55.3% of EU imports and receive 46.5% of EU exports.